Video of the accident scene at the Family Christian Stores where a Buick crashed through the store window. A white Buick sedan rests in the store window sill of the Family Christian Stores. A two-car accident resulted in one of the cars crashing through the Family Christian Stores in the 300 block of East Rand Road. A white Buick sedan and a mini-van collided and the Buick spun backwards into the Christian bookstore about 1:00 p.m. Wednesday. At least two people were injured. Arlington Heights Fire Department paramedics transported two victims to the hospital — both believed to be from the vehicles. Rand Road was shut down for about thirty minutes while crews removed the car from the store. Precautions were taken with a fire engine with a charged hose line in case a fire started while the car was pulled out of the building by the tow truck operator. Last week a single car accident involved a Lexus SUV crashing into The UPS Store at the same shopping center at the corner of Rand Road and Arlington Heights Road. 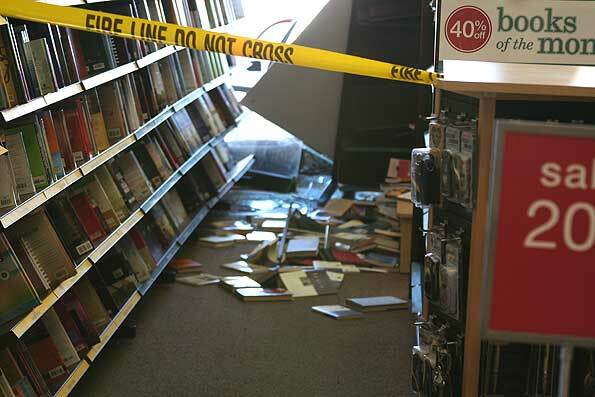 Books crashed onto the floor at the Family Christian Store.